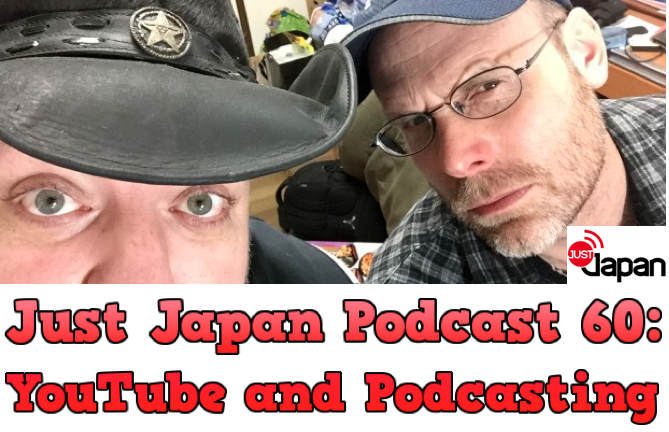 In Episode 60 of the Just Japan Podcast, host Kevin O’Shea chats with returning guest Jim Mullins (aka Mully), cohost of the Mully’s Place Podcast about video blogging and podcasting in Japan. What does it take to start a YouTube channel or a podcast? Kevin talks about the recent 2015 Osaka YouTube Hanami Party, missing a week of the podcast and how he’ll promote your podcast if you want to start one! Also, The Fulcrum (The Univerity of Ottawa newspaper– in Canada) recently wrote a story about the Just Japan Podcast and let’s cross our fingers…the 2015 Podcast Awards will announce the winners (we’re nominated for Best Travel Podcast) April 14th (Las Vegas Time)! SUBSCRIBE to the Just Japan Podcast in iTunes (best way to stay up-to-date). Listen using the Libsyn web player. Download this episode (m4a file). SUPPORT the Just Japan Podcast on Patreon.com (anything helps!). READ about the Just Japan Podcast in a recent article in The Fulcrum (University of Ottawa newspaper). Check out the GaijinPot Blog where the podcast often appears! SUBSCRIBE to the Mully’s Place Podcast and check out Mully’s YouTube channel. LIKE the Just Japan Podcast Facebook page (join the awesome community). Check out my YouTube presence (BusanKevin) and (jlandkev).